Some call it liquid gold, but I think Homemade Garlic Ghee is more like liquid sunshine. It makes me so happy and takes only minutes to make! Fill me up butter-cup! 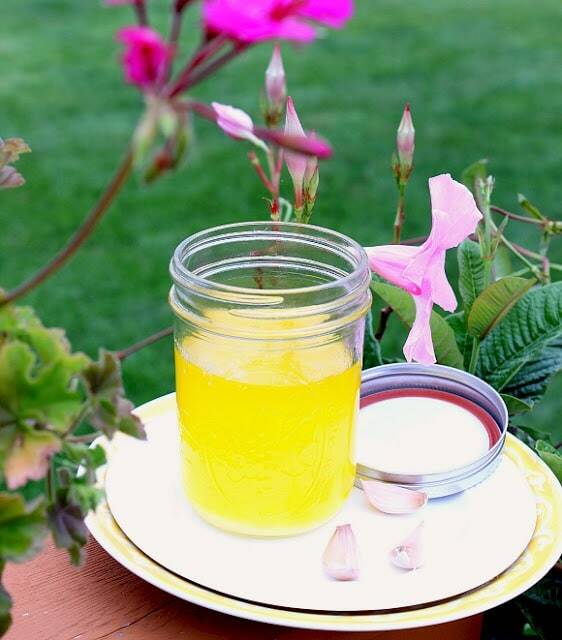 **Please Note – The printable recipe card with detailed instructions and complete ingredient measurements for making Homemade Garlic Ghee is available near the end of this post. Ghee is traditionally the major fat source of Indian cooking. What makes it different than plain old clarified butter is that it’s cooked longer in its milk solids that give ghee its distinct and more intense butter flavor. Ultimately the milk solids are strained away leaving only the pure amber, liquid gold. Because ghee’s milk solids are separated from the fat during the cooking process and then strained off, ghee is far superior for people who have trouble digesting dairy. Is it easy to make Homemade Garlic Ghee? What are the steps? Add butter into a saucepan along with smashed garlic cloves. Stir well. Melt butter over medium-low heat. Raise the heat to medium-high allowing the butter to come to a low boil. Boil for 1 minute. Reduce the heat to medium-low and simmer for 7-8 minutes. You’ll notice the milkfat on the bottom of the saucepan. Place the cheesecloth in the strainer and strain the clear garlic ghee into a glass jar and discard the solids. Cool the ghee before adding the lid to the jar. 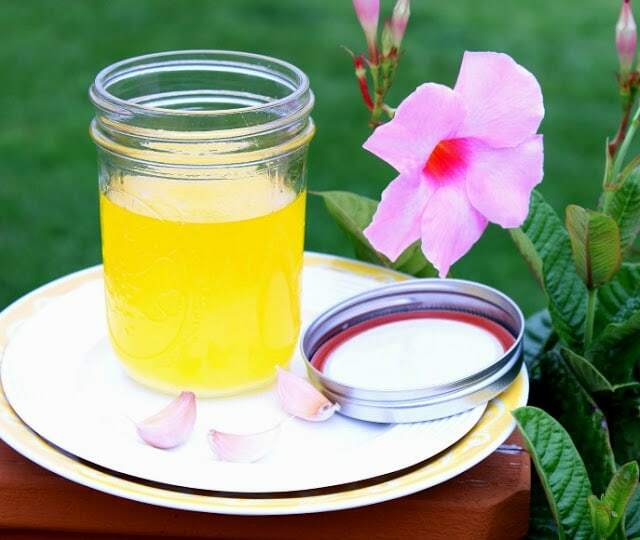 Homemade Garlic Ghee is perfect for those people who are following a keto (ketogenic) diet in which your daily caloric intake is mainly from healthy fats. It is rich in medium chain fatty acids that are absorbed directly to the liver (like carbs) and burnt as energy. Ghee is also rich in oil-soluble vitamins A and E, and it stimulates the secretion of gastric acid, thus aiding in the digestive process. Because ghee has had the milk solids, water, and impurities removed during the cooking process, it’s perfect for cooking and frying due to its high smoking point. Ghee won’t break down into free radicals as some other cooking oils do. Homemade Garlic Ghee also doesn’t require refrigeration and will last up to 3 months (not that you’ll have it that long) when stored in a dark place. Once it cools ghee will turn into a semi-solid and will turn a pale yellow color. 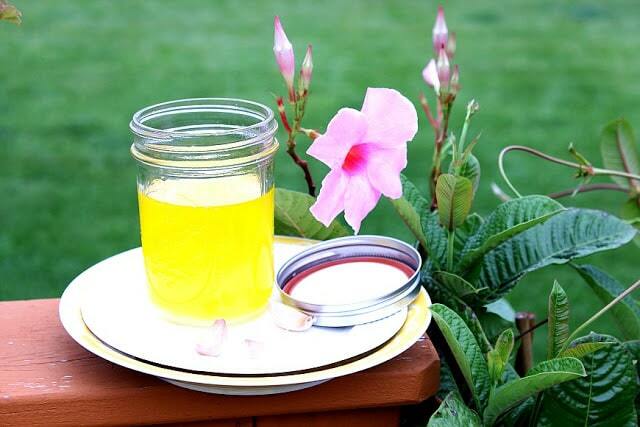 Ghee liquefies immediately upon being heated and the flavor it imparts to foods is unlike any other. I urge you to make some today. I have only scratched the surface regarding the benefits of ghee and why it’s so important to have on hand for your cooking, and for your health. If you’re curious to find out more, the internet has a wealth of information about ghee that I just know you’ll find fascinating. 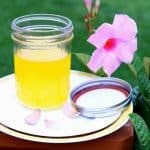 Ghee can be purchased in many markets and specialty stores (i.e., Trader Joes and Whole Foods) but it’s very costly if you’re going to purchase it already made. 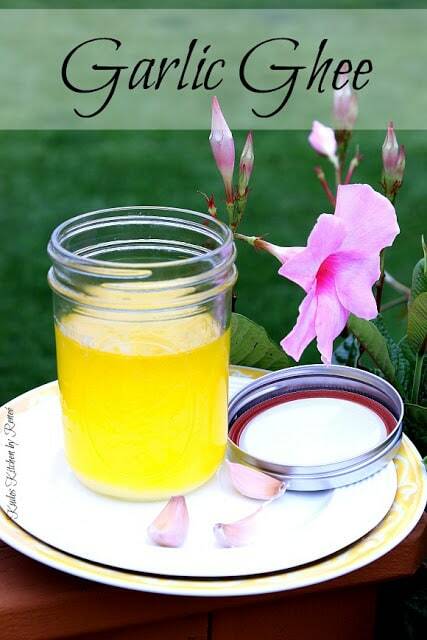 Making your own ghee is highly rewarding, takes only minutes to make, and will save you money too. Ghee whiz…what’s not to love? Below is the printable recipe card for today’s Homemade Garlic Ghee. If you’ve enjoyed this recipe and look forward to making it (or have already made it), I’d appreciate if you’d take a moment to give it some feedback by way of stars near the comment section at the end of this post. Thank you so much! In a medium saucepan over medium/low heat, melt the butter. Add the garlic and stir. Increase the heat to medium/high and allow the butter to come to a boil. Boil for approximately 1 minute. Reduce the heat to medium/low and simmer lightly for 7-8 minutes. You'll notice the milk fats have settled on the bottom of the pan and the clarified butter is on top. Use the strainer and cheesecloth to strain the ghee into a glass jar and discard the milkfat. Allow the ghee to cool and place the lid on the jar. Store in a cool, dark place for up to 3 months. Use as you would regular butter and also to saute and pan-fry foods. I sincerely hope you’ve enjoyed today’s recipe for Homemade Garlic Ghee as much as I’ve enjoyed bringing it to you! 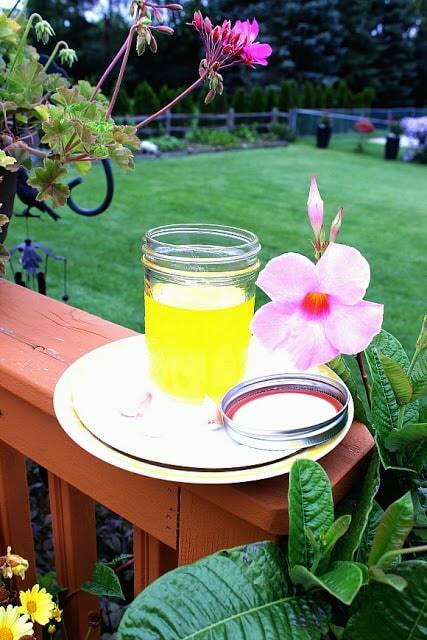 With my backyard flowers looking so pretty this summer (we’ve had a TON of rain in the Midwest), I couldn’t help but want to take these ghee photos outside among the blooms and green grass. To me, the ghee in these photos depicts sunshine and happiness. The blooms also remind me of Hawaii (although I’ve sadly never been). And also of these fun, Hawaiian bakery themed coffee mugs I painted for a client a while back. To this day, they’re still some of my absolute favorites. Should you have any questions regarding this recipe, or anything else you’ve seen on my site, please don’t hesitate to contact me directly or leave me a comment in the comment section below. It is always my distinct pleasure to get back to you with a reply just as soon as I possibly can! Sounds like something awesome to try. I've heard of it, seen it in stores and could never make myself pay for it. Making my own seems like the way to go. So did 1 lb. of butter make the amount pictured in your jar? Yes, Katrina. What I've shown here is what one pound of butter makes. Try it. I know you'll like it! I've had ghee before but I've not made it at home yet! I thought it was much harder to make but this sounds so easy! Everyone needs a little ghee in their kitchen. This is such a great thing to have on hand! When I worked in restaurants, I used to make ghee by the gallon, but I rarely make it at home. I need to change that, it's so great to have on hand. I love that you've infused it with garlic. I haven't made ghee in a while and now I'm thinking another batch is in order. It's just magical, there's no other way to put it! Ghee is already amazing to start with, and I can imagine it's even 10 times better when infused with garlic! Much easier than I thought it would be to make, thanks for sharing!